Ricky Dean Taylor Jr., 48, a resident of Junction City, Illinois and formerly of McLeansboro, IL passed away Monday, October 15 at Deaconess Midtown Hospital in Evansville, IN due to injuries sustained in a motorcycle accident. He was born December 16, 1969 in McLeansboro, IL to Ricky Taylor Sr. and Sharon McKinney-Taylor. 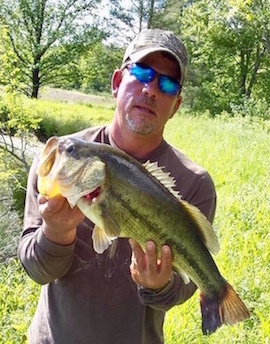 Ricky had a passion for the outdoors and was an avid hunter and fisherman. Ricky is survived by his mother, Sharon (Danny) Gillis of Odin, IL; son, SPC Dylan Taylor, United States Army, Baumholder, Germany; daughter, Alexis Taylor of McLeansboro, IL; maternal grandmother, Wanda Gillis of Odin, IL; two brothers, Mike Taylor and Jeff Gillis, both of Odin, IL; and four sisters: Brenda (Roger) Hails of Salem, IL, Jennifer (Keith) Clark of Odin, IL, Jessica Gillis of Odin, IL and Amy (Jason) Hall of Kinmundy, IL. Also surviving is the mother of his children, Rita Scott of Thompsonville, IL and many nieces, nephews, cousins, aunts, uncles and many special friends whom he loved dearly. He was preceded in death by his grandparents, Elmer and Mary Taylor and Jeff and Audrey McKinney; and his father, Ricky Taylor Sr.
Funeral services will be held Friday, October 19, 2018 at 7:00 p.m. at the Gholson Funeral Home in McLeansboro with Rev. Harl Cockrum officiating. Visitation will be Friday, October 19 from 5 p.m. until the time of service at 7 p.m. at the Gholson Funeral Home in McLeansboro. A private interment will be held at a later date. Memorial donations may be made to the family to help with funeral expenses.